We've been studying the design of soakaway systems for artificial sports surfaces recently. For those not familiar with these things, soakaways allow rainwater to soak into the ground as opposed to discharging into a ditch or stream. Amongst numerous advantages, this is a way of complying with flood prevention regulations that are applied to planning applications. Of course, we're concerned to minimise flood risk, whether this is a legal requirement or not, and we address this with regard to our natural turf systems also. 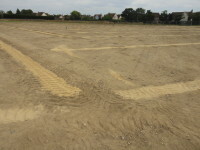 What has proved particularly interesting is the cross-over of thinking between artificial and natural turf on the inter-related subjects of soakaways, attenuation (water storage) and drainage. Considering artificial surfaces first, these are constructed on top of the subsoil after first removing all of the topsoil. The subsoil has the capacity to absorb water, and the rate at which it does so has to be determined as part of the design process. Rates vary depending on the circumstances, but typically range between say 10-9m/s (0.036mm/hr) for a heavy clay to 10-4m/s (3600mm/hr) for a well graded sandy gravel. Also, part of the design process is the identification of how much rain you actually want the surface to cope with. In this respect, planners can be very demanding and often expect the design to cope with the most severe storm that might occur in a 100 year period, and with an additional 30% or so on top to allow for climate change. That's a lot of rain, the actual amount varying in relation to the geographical location of the site. Obviously, there are very few subsoils that will have rates of infiltration fast enough to cope with this lot. However, even that very severe storm won't last forever. So, during the storm, a given quantity of water will land on the surface over a particular time. Some of this needs to be located somewhere whilst it soaks into the subsoil, if it is not to flow away down a ditch and flood the houses downstream. 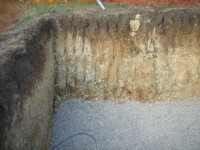 The purpose of a soakaway is to provide somewhere for that water to go while it soaks away. So, the volume of water that the soakaway needs to retain is the difference between the input (rainfall) and the output (infiltration). Simples! 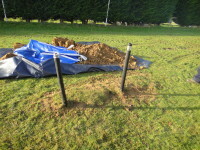 The soakaway will be more effective if it has a large surface area over which water may actually soak into the subsoil. The models that are used to help you design soakaways assume that all of the water moves out of them through the sides only and not through the bottom. So, long trenches tend to be more efficient than large single holes in the ground. If you fill the soakaway with stone, as you often have to do, you're taking away potential water storage space and so necessarily increasing the overall volume required. These are all design features to be attributed to the soakaway. Similarly, the models assume no water is absorbed vertically into the subsoil surface immediately below the sports facility; these horizontal surfaces are assumed to clog up with finer particles. You can argue about this point but, in practice, it doesn't make that much difference. And arguing with planners is not something you want to be doing too much of anyway. So, assuming the infiltration rate of the subsoil is sufficiently rapid for a soakaway system to be possible (sometimes they are not), that system might consist of a series of trenches beneath or close to the facility. Those trenches need to be sufficiently deep and long to provide the necessary side surface area to give the output (infiltration) rate to cope with the storm. They also need to provide sufficient storage volume to cope with the backlog that develops during the storm. Clean stone backfill, typically, has a storage volume of around 30%, which immediately demands a three-fold increase in the volume of material that needs to be dug out. You might use a cellular system, perhaps in a single excavation, that would greatly reduce this, but these are very expensive. An analysis of the combined costs of excavation and of stone associated with any particular soakaway design, against that of cellular systems, needs to be made to give best value for the client. But, artificial surfaces have layers of material beneath them which can themselves hold water. So, whilst the capacity for the vertical absorption of water by the subsoil surface may be unavailable to us, this storage capacity is. Indeed, if a stone layer, say 300mm deep, underlies an artificial surface, with 30% void space within it, this could very well provide most, if not all, of the necessary storage volume needed to cope with the critical storm. 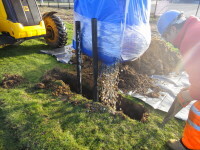 A shock pad, a porous macadam layer and even a sports carpet itself will have the capacity to retain some water, and that capacity can also be incorporated into these calculations, provided the connection with the soakaway system is maintained. The materials beneath an artificial sports surface provide many of the structural properties that are, of course, also required for the sports concerned, but there is considerable diversity in how deeply these are laid down and of what material they are actually composed. 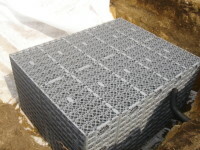 In terms of the design, however, provided the structural requirements of the surface is met by the layers beneath, there will be in each circumstance a particular depth, choice and arrangement of materials that will provide the necessary storage volume in relation to a particular soakaway design. It is then simply (!) a matter of determining the most cost effective means of delivering this. For any particular design, the client, and the planners, should be made aware of the figures and the thinking that has gone into this. 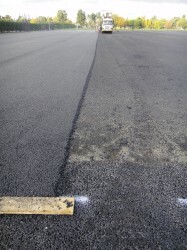 The planners will need this information anyway and the client will be more reassured, when comparing two or more proposals in a competitive tendering situation, that one or other is going to deliver the same quality of surface whilst being of a lesser overall cost. That is how free markets should apply to the design and construction of artificial surfaces. There is, unfortunately, some confusion over how these features relating to flood prevention apply to natural turf situations. For example, I have been asked by planning authorities to design soakaway systems for natural turf facilities that conform to the stipulations applicable to totally impermeable surfaces, such as a supermarket roof! This is clearly ludicrous and this less than enlightened approach, or less extreme versions of it, can lead to perfectly good natural turf development projects being prevented from going ahead due to the excessive cost of the soakaway system that is supposedly required in association with it. The problem is that there is, as yet, no technical protocol for relating the improved performance in terms of surface water dispersal that newly constructed, or improved natural turf sports surfaces, may have and their impact on flood risk. But the situation I describe above concerning artificial surfaces, though not identical, has many parallels with natural turf systems, and this may provide the way into achieving that protocol. Improving soil conditions, for example by incorporating sand carpets or sand banding, or altering soil structure, for example by verti-draining, is the equivalent to altering the types and arrangements of materials in the layers beneath a carpet. Natural soils have void space in the same way that a stone carpet has void space, although the extent of this is very variable and far less easy to predict. These factors affect the capacity of the topsoil to retain water before it is able to pass into whatever drainage or soakaway capacity may lie beneath it. It is dependent on factors such as the soil texture, the degree of soil compaction and also the time of year as seasonal variations in soil moisture content also occur. Soil structure and texture also affects the speed with which water transfer to an underlying drainage or soakaway system takes place. 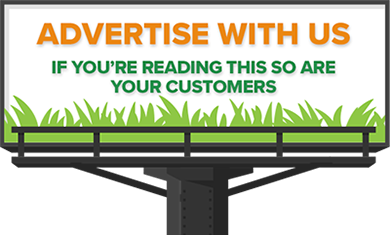 For artificial surfaces, that transfer is assumed to be instantaneous. 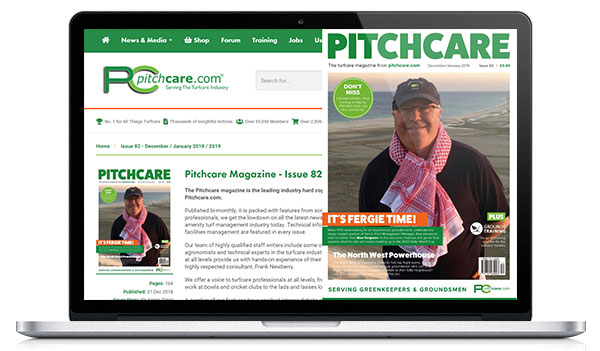 For natural turf, it certainly is not, and it is here that the complications really arise. A brief mention of infiltration rate measurement is appropriate here. 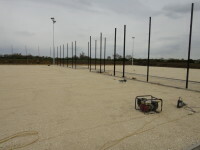 This is a key component for example of the Sport England 'playing quality assessment' method for natural turf surfaces. 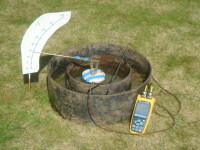 That measurement refers to the rate at which surface water is able to penetrate the topsoil. It could be related to the rate at which soil water enters the subsoil and/or drainage system, but this is less easy to be sure of. What it is not is a measure of the rate of subsoil infiltration as referred to above. To measure this, very deep and substantial holes have to be excavated and filled with water, and the measurement taken according to a very strict and clearly defined method (BRE 365). 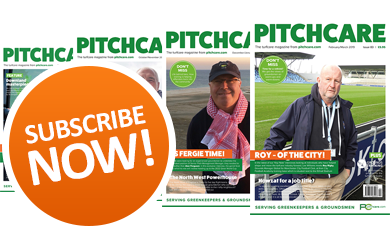 Having got through the topsoil, or pitch construction, water will behave beneath a natural turf surface in exactly the same way it will beneath an artificial surface. So, the criteria relating to soakaway design or drainage discussed above may be applied from the topsoil/subsoil interface in exactly the same way. 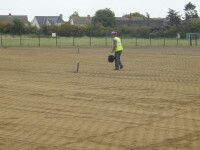 It is in the nature of the topsoil or natural turf pitch construction that the most variability exists, and this upper section of the facility, as we have seen, greatly influences the design of the associated drainage or soakaway system. I believe that, by thinking about natural and artificial sports surfaces in this way, we are getting closer to a 'Grand Unifying Theory' of sports surface optimisation and flood prevention. It would appear that such a theory is necessary in order to ensure that projects are able safely to go ahead in a sustainable manner, thereby bringing more sport to more people in a cost effective way, which is surely our ultimate objective.